Saturday—The Grand Ole Family Vacay Begins! We left home in the Ford Fiesta before 8:30 am, two parents, two kids, and several suitcases, ready for our first big family road trip. The gas tank was full and the excitement was high. It didn’t last long. By 8:53, we’d already had one episode of carsickness and one coffee spill in the new car. As the Starbucks soaked into the interior and the scent of used Asiago bagel wafted into the front seat, I shook my head and thought, “I can’t have nice things!” We hadn’t even made it off of the outer belt yet and we’d already had multiple mishaps. Needless to say, I was skeptical about the day—and the trip—to come. Fortunately, things did improve from that point forward. Seven hours and one Cracker Barrel Stop later, we rolled into the Gaylord Opryland Hotel, rolled being the operative word. We actually rolled to a stop behind a very long line of other travelers eager to begin their own Opry Land Experience. After nearly another hour of starting and stopping, we reached the entrance and unloaded for the night. 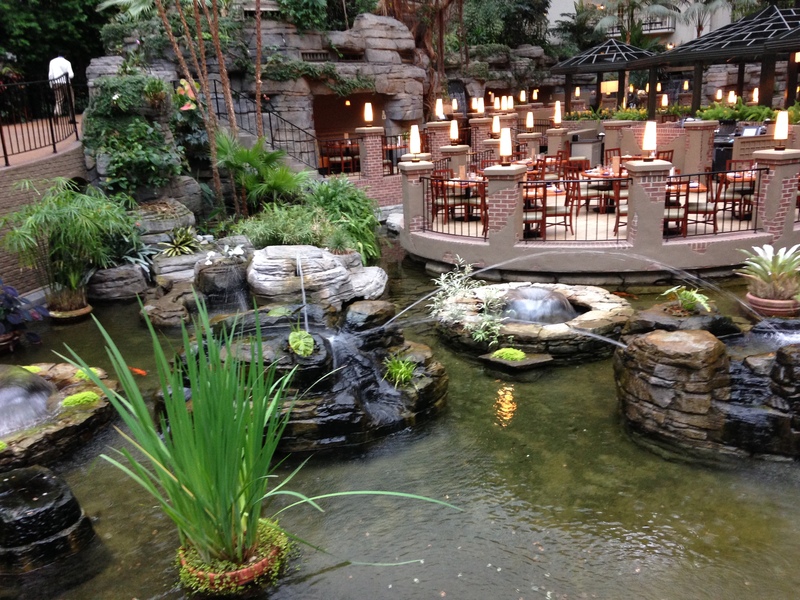 Children and parents alike were thrilled with the hotel accommodations, particularly the beautiful Cascade Conservatory filled with blooms and waterfalls of all kinds to explore. 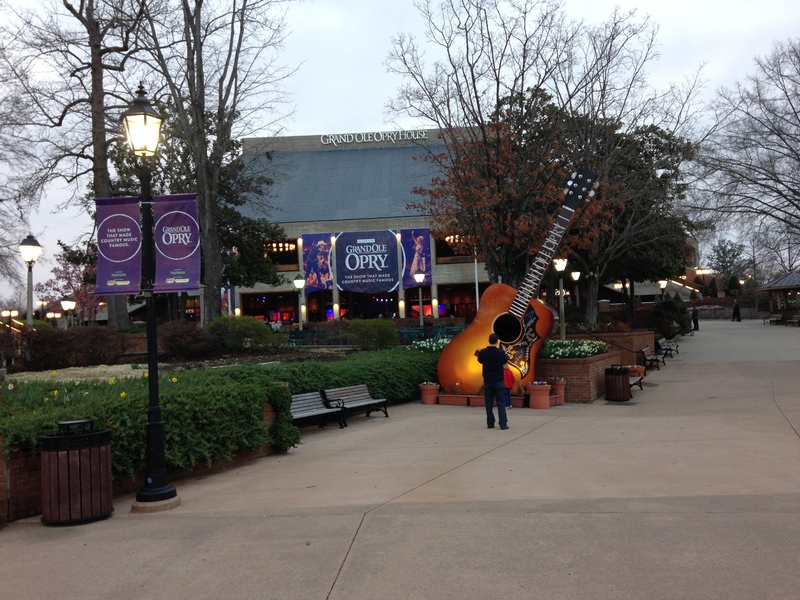 We grabbed a slice of pizza from Paisano’s and we were off to the main attraction: A Night at the Grand Ole Opry! To be honest, this was not something that my husband and kids were all that thrilled about, but they indulged me, as I insisted that like it or not, it was a once-in-a-lifetime experience that everyone should take advantage of. Hubby made jokes throughout the show to amuse himself, claiming that John Conlee was actually our own Bud Watkins, former District 40 Governor for Toastmasters International. Child number one repeatedly threatened to doze off, while child number two interrupted frequently to point out that the entire event would be much more exciting, if only there were snacks to be had. I, while never truly a country music fan either, was enthralled, lapping up every note and at times, getting just a little misty. At some point, I questioned what exactly it was about the whole thing that could evoke such emotion. I think it’s this. Every star that appeared on stage that night, whether old or young, seemed to show a genuine concern and respect for each other that often seems lacking in pop culture. They truly appeared to be one big family. When Little Jimmy Dickens, who was easily 90 years old, ambled out on stage and sang, admiration filled the air. Somehow, I have a hard time imagining the same type of reception for Britney Spears performing at age 100. Not only that, but the stories told by the music were incredible and there was no use of auto-tune or synthesized music. There was something simple, very raw, and very real about all of the performances that you just don’t get from most pop music these days. I was touched. I don’t know if I’d call myself a country fan just yet, but my appreciation for the genre might run just a little deeper. Previous Bitterman, Party of One! Next Sunday—There’s Something Fishy Going On!